John will not be swayed. So might as well make sure he doesn’t kill himself. Soul Symphony is back! Thanks for your patience. Now time to jump into a familiar Soul World. Y’know friend of the comic, Piano Scientist? Well, he’s got an EP of winter-themed ambient music! And he’s using the proceeds to buy food for a food drive! So listen to that over here! Don’t get any soul problems of your own while you’re in there. I swear, if Charlie’s powers aren’t the most badass thing, I’m going to be so disappointed in you. And I’m back…Aparently on the same day you return from a hiatus. It’s been over a year and I’m rereading the comic; I forgot how good this was. Glad I finally have time to get back to this comic, it’s very original and inventive. Thank you, that really means a lot. I’m glad to see you’re back! Thanks. Noticed you never explained Amanda’s symbolism even though you said you would. Whoops. Maybe as a filler strip? Annabel, sory. Amanda is a character in a story I’m writing recently. 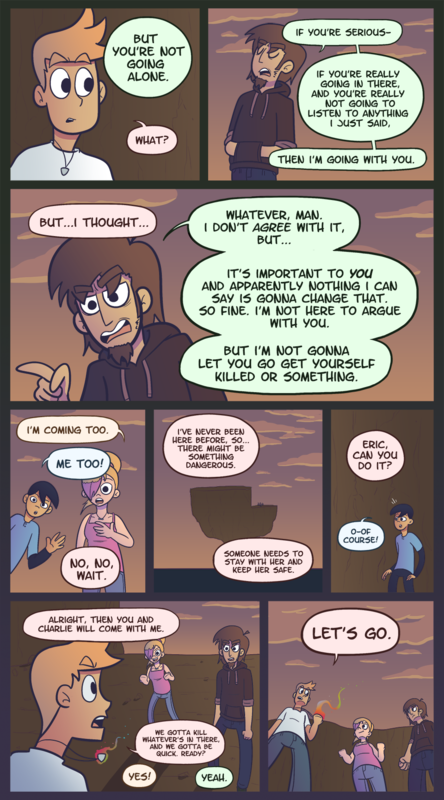 Aw man, Eric was the one I was most looking forward to seeing fight in the Soul World. Oh well, I’m sure it won’t be long before something in Dalton’s soul world causes trouble for him. It will be interesting to see how this new group dynamic plays out in Olivia’s soul world. I wonder if she’ll wake up before they get out. Just her and Eric would be super interesting too. Whatever happened to “and look for clues”? 6 moths of catching up to do, yaaay!! !